I believe in the power of praying the Scriptures for my husband! As we head into November - a month that is all about being thankful, I want to encourage you to focus on all the ways you are thankful for your husband. It's important we are intentional about the thoughts we think about our husbands. I know this to be a true statement because I've seen it too many times in the past where I have dug a deep pit with the negative thoughts I've let enter my mind concerning my husband. If you continue to let this thought pattern prevail in your mind, those thoughts will manifest into feelings that will have a negative impact on your marriage. You can break the bad habit of negative thoughts toward your husband today! God tells us how in His Word. This Scripture verse transformed my thought patterns concerning my husband! Whenever thoughts try to enter my mind that do not line up with the truth of this verse, I have learned to quickly cast aside that thought and replace it with one of these traits above: true, noble, right, pure, lovely, admirable, excellent and praiseworthy. I hope you will be encouraged to do the same. Another habit that will help you to transform your thoughts concerning your husband is to pray for him. As I've said here before, even more than carrying the title of "husband", my husband is more importantly my brother in Christ and he needs my prayers. When you begin to pray for your husband, you will see a change in your thoughts toward him. When you see areas where he is struggling, instead of complaining or letting it create a division in your marriage, you will see specific areas to concentrate your prayers for him. 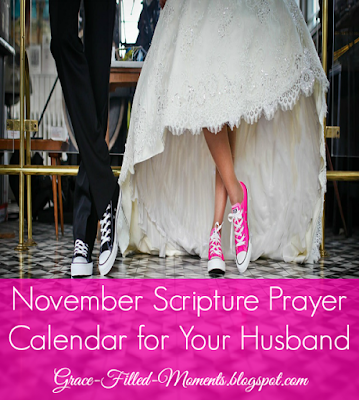 Here's the November Scripture Prayer Calendar for Your Husband. It is my prayer that you will print a copy of this marriage prayer calendar and place it within your home so that you will see it every day and pray the verse for your husband. I promise you, you will begin to see a difference in your thoughts toward your husband. Your marriage will become stronger, and peace will come into your home. I've experienced it in my own marriage and home, and know God can do it for you and your marriage too.